Hello all – a quickie post here tonight as I get ready to get the sons to bed…..
Hallmark has some wonderful interactive storybook apps for the iPad. 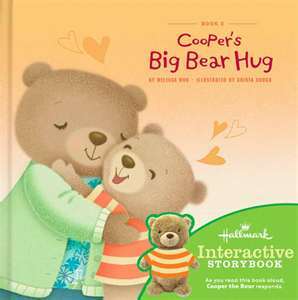 One darling story is called, “Cooper’s Big Hug” – the story of a little bear on the search for a way to show his mother how much he loves her. I created some sequence pictures from screenshots on my iPad, and a word bank to guide the re-telling narrative for students. This story is also fairly “loaded” with the /k/ and /g/ sounds (“big, hug, cooper, frog, acorn”, etc. ), so I plan to use this with a little articulation kindergarten friend working on these speech sounds at the sentence level currently.